After all the activity of the ski portion of our trip, I was ready to relax a bit, and Valparaiso is perfectly suited for slowing down and taking things in. 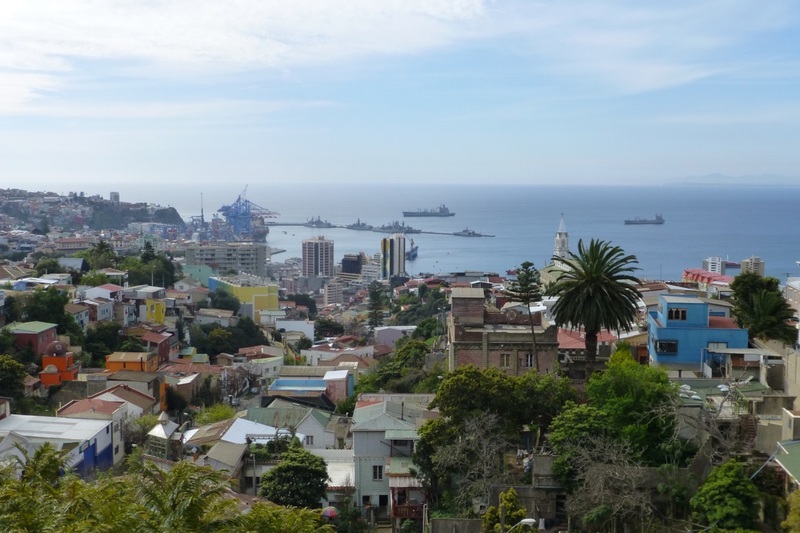 Valparaiso, a port city, is considered the “cultural capitol” of Chile for good reason. It’s made up of a flat part along the port, then rises high on 42 granite hillsides covered with a charming patchwork of old, brightly colored, precariously perched houses. A central part of the city has been declared a UNESCO heritage site, intent on preserving its historic architecture and the steep funiculars (elevators) that transport you from the flat port-side to the hills above. 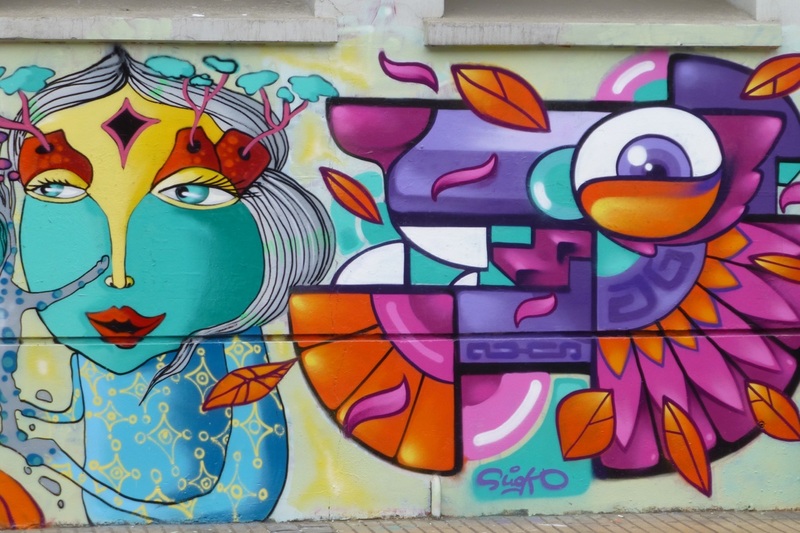 Throughout the city, vibrant graffiti-covered walls pop-up in unexpected places where prominent local street artists used the city itself as their canvasses, and street performers dance, play music, juggle, or do whatever is in their heart that needs expression. The result is a city that is a brilliant, crazy quilt of color, music, and art—alive, ever-changing, constantly folding on itself and re-emerging as a new creation. Valparaiso is what I imagine San Francisco was like in the 1960s. As it happens, we were in Valparaiso for several days of Dieciocho (aka Fiestas Patrias), Chile’s Independence Day and one of the most important holidays of the year. Agustin, our B&B host in Portillo, explained the holiday like this: “Every Latin American culture has a carnival, or multi-day (or month) celebration. For Chileans, this is our carnival.” Dieciocho, which literally means “18th” because Independence Day is commemorated on the 18th of September, is a celebration of Chilean independence from Spanish rule, the process of which began on September 18, 1810. Typically, Dieciocho lasts for about a week and is a celebration of all things Chilean: song, dance, traditional clothing, food, and drink. It’s a national fiesta of Bacchanalian proportions, with locals imbibing their favorite drinks and eating copious amounts of barbecued meat. I read one article that said that meat sales during this holiday alone is around 50 million dollars. That’s a lot of meat. Dieciocho is also a time when there are a lot of fondas happening throughout the country, which are pop-up venues and festivals that feature song, dance, and local foods. In fact, as we were walking back to our Airbnb on our second night—intending to have an early day after a lengthy walking tour—we were waylaid by a friendly local who was inviting random passersby to his band’s “gipsy fonda,” where his Balkan/Latin fusion band was playing. Curious (and filled with the spirit of Dieciocho), we entered through a rickety wooden gate into a narrow yard squeezed between two ramshackle buildings. The yard looked as though it was hastily made into a venue, with seating that included a random assortment of abandoned couches and benches made of wooden pallets salvaged from the shipyards. A covered, makeshift bar was set up in one corner, serving all the Dieciocho standards: beer, terramotos (wine punch topped with ice cream), navagaos (mulled wine), anticuchos (kebabs), completos (hotdogs), and empanadas (stuffed pastry). Having been urged earlier in the trip to try terramotos, we ordered our first one. We sat, drank our terramoto, and observed the slowly growing crowd, which was made up of Bohemian/artsy looking locals and the occasional tourist that was enticed to enter, just like us. One of the band members, the drummer, chatted with us and offered us more drinks. At one point he commented that David looks like Sylvester Stallone (he must’ve had too many terramotos). 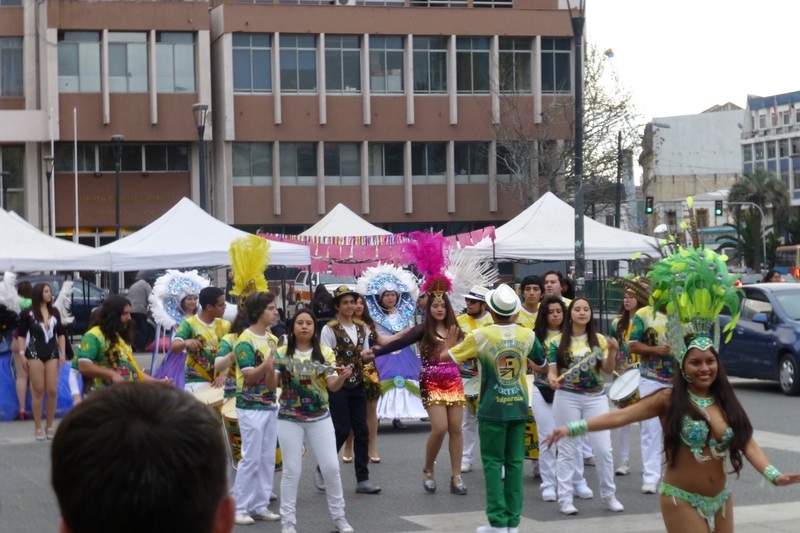 Eventually, the music began and it was an impressive, lively performance of “gipsy” music with a Latin flair, full of horns, clarinet, accordion, and even a dancer swaying to the music with bells on her fingers. 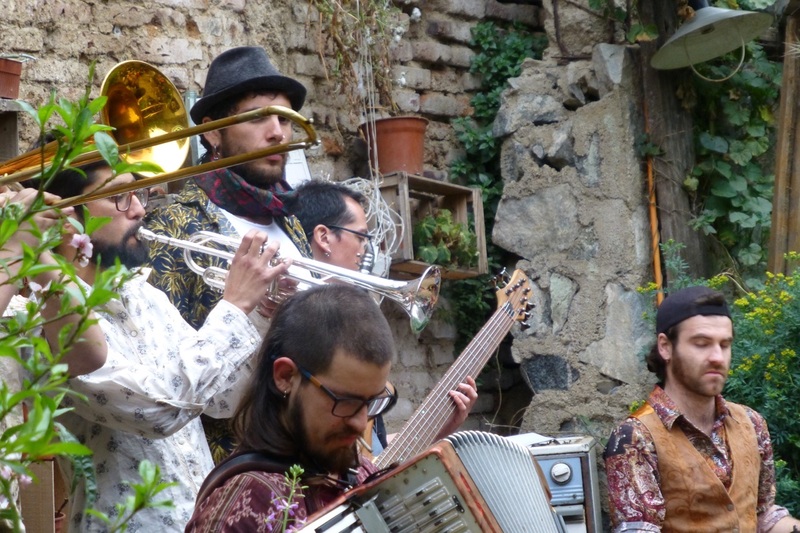 The gipsy fonda experience struck me as a perfect metaphor for Valparaiso: it’s a fusion of old and new, appearing random, but when put together, produces a beautiful sound. It’s colorful, expressive, quirky, vibrant, full of fun, and lives in the moment. 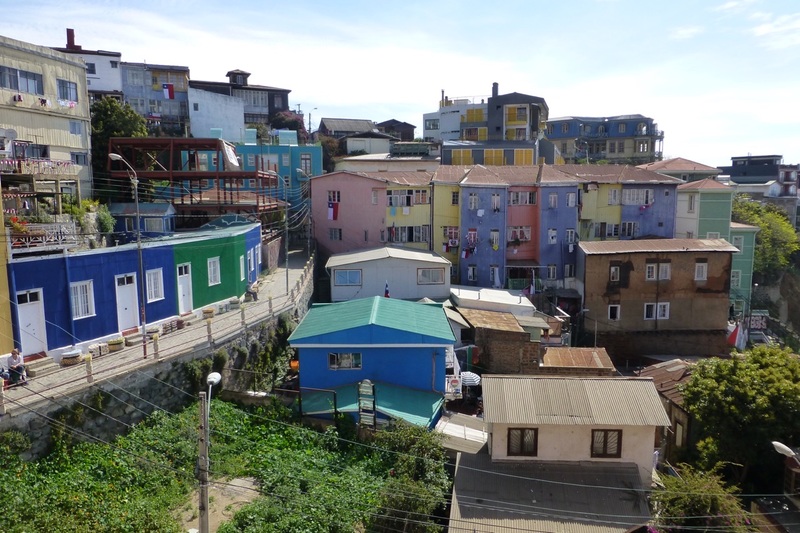 Being in this city during Dieciocho felt like we were seeing Valparaiso in all of its glory. It was a great place to relax and be a part of the national celebration.